The leather jacket has become a wardrobe staple in recent years, and for good reason — it literally goes with everything. 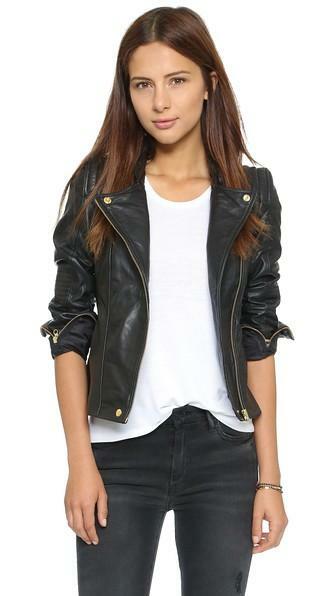 The benefit of that is that now there’s a huge variety of leather jackets and for every budget. 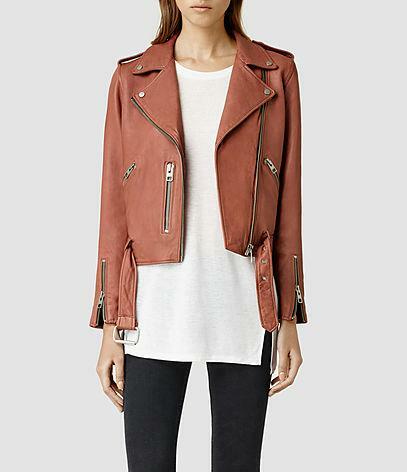 From the classic black moto jacket to ones in pretty pastel hues, here are 10 leather jackets for every price point. If you’re looking for a splurge, this Acne Studios jacket is the one to get! The classic fit will go with everything in your wardrobe, and its unique color will make it an extra special piece in your closet. 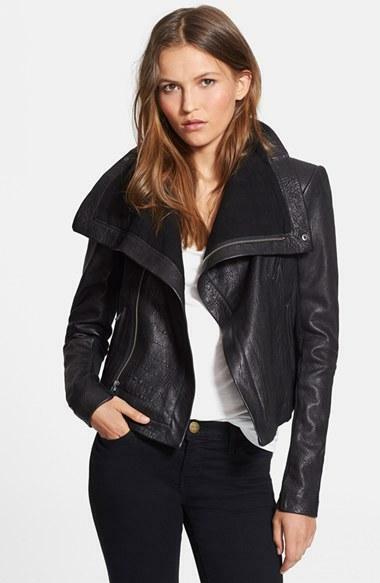 This plush leather jacket features an asymmetrical zip and a high collar, resulting in a stunning piece that you won’t want to take off. This beauty is the perfect addition to your fall wardrobe. The wool front panels adds a soft touch to the traditional leather jacket, making it a great piece for a polished but trendy look. 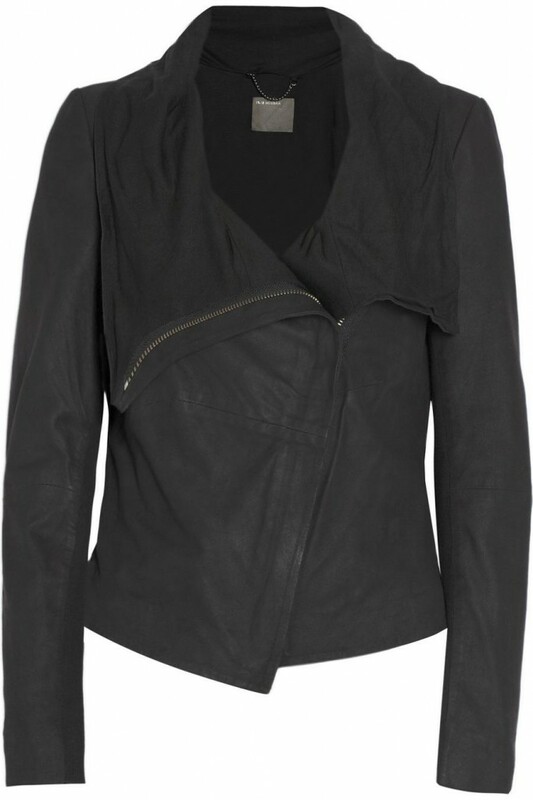 The draped collar adds a modern twist to the leather jacket, and is a softer look that’s great for the office or for more dressy occasions. The ribbing on the sleeves also makes it a great tapered fit and extra comfortable to wear. An extra bonus: it’s on sale — get it while you can! This beautiful camel color is a refreshing look for the iconic silhouette. Slightly boxy and easily wearable for everyday, this is a great modern neutral. The classic motorcycle jacket at a very reasonable price. Throw it over a tshirt and jeans or a flirty dress — there’s no wrong way to wear this! This beige draped jacket is not what comes to mind when one thinks of a leather moto, but it’s nonetheless versatile and so cool. Pair it with an all neutral look for a sophisticated and chic look. 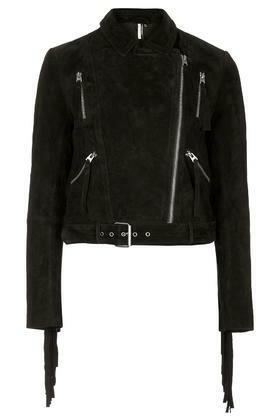 Rock the 70s trend this season in this suede jacket with fringed arms. Pair it with a crisp white button down and dark skinnies, and this will be the star of your outfit. 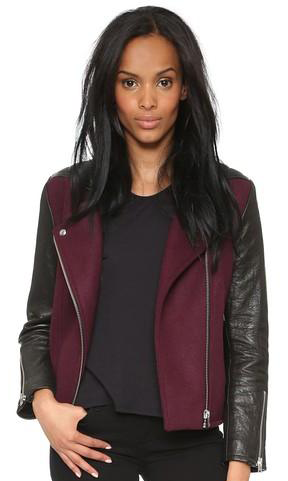 Swap out your usual jacket for this one. It’s an effortless way to add some edge to your look. This beautiful peach jacket will look gorgeous on most skin tones, and the hem is great for pairing with a skirt or high waisted skinnies. 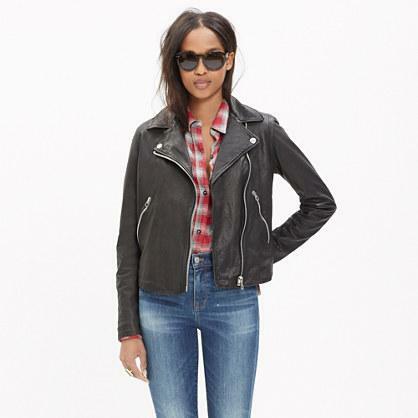 A leather jacket is our favorite way of effortlessly adding a urban and edgy vibe to any look. Wear it over a white t-shirt and black pants for the your new running-errands uniform, or pair it with a feminine dress for the perfect balance of feminine and grunge. However you wear it, there are plenty to choose from!